Niranjanananda (Senior), born as Nitya Niranjan Ghosh, usually called by the shortened name of Niranjan, was one of the foremost monks of Ramakrishna Mission and was one of the direct monastic disciples of Ramakrishna. Niranjanananda was one of those few disciples, whom Ramakrishna termed as "Nityasiddhas" or "Ishwarakotis" – that is, souls who are ever perfect. [Niranjanananda is termed Senior since there was another swami, Niranjanananda (Junior) also known as Pandalai Maharaj, later in the Ramakrishna Mission who died in 1972]. Even though his tenure with the newly formed Ramakrishna Mission was short lived owing to his early death, he left an indelible mark in spiritual and philanthropic activities. 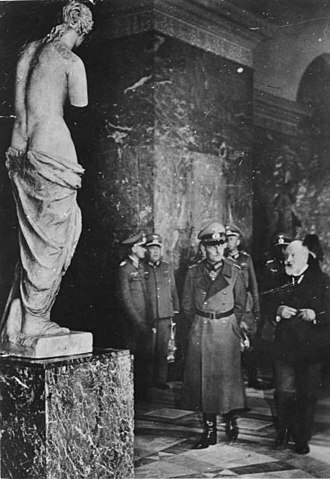 He had a majestic appearance, being tall with broad shoulders and strong physique. Niranjanananda was born as Nityaniranjan Ghosh and he was called by the short name of Niranjan. Little is known about his early life except that he came from a village called Rajarhat-Bishnupur in 24 Paraganas of Bengal province. He lived in Calcutta with his maternal uncle Kalikrishna Mitra. In his boyhood he became associated with a group of spiritualists and was considered as a successful medium. :126 He was very frank and open minded, a trait which was appreciated by Ramakrishna. He had an abhorrence for married life and a relatively short temper, even though he was tender in nature. :129 He later took up job with an indigo planter in the district of Murshidabad. Ramakrishna also disapproved of Niranjan working in an office, but he consented when he heard that Niranjan took up the job to maintain his aged mother. When the master was ill and was kept in Shyampukur by his devotees, Niranajn quit his job to work as the gatekeeper of the house. There he was fooled by actress Binodini Dasi who visited an ailing Ramakrishna in the disguise of a European gentleman. Later when Ramakrishna was shifted to Cossipore garden house he continued with his role as a gatekeeper with utmost devotion and prevented at least two lay disciples of Ramakrishna from entering the premises when the master was critically ill, among them Ramachandra Dutta and Atul Ghosh, the brother of Girish Chandra Ghosh. 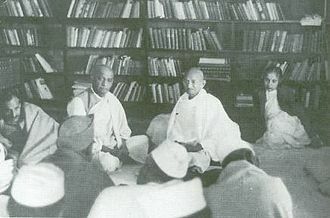 After the death of Ramakrishna, there was a dispute among his disciples with the ownership of the relics which was mitigated with the help of Narendra (later Vivekananda). Niranjan, together with Shashi Maharaj (later Ramakrishnananda) preserved most of the relics in a separate urn and this they kept in the house of Balaram Bose, which was later removed to Belur Math. Niranjan took his monastic vow along with other brother disciples in 1887 and came to stay permanently in the Baranagar Math, the first abode of the monks of the Ramakrishna order. He was given the monastic name of Swami Niranjanananda (Niranjan – the blameless or the guileless one, and ananda – bliss), by Vivekananda. In the monastery he did most of the laborious tasks, being physically stronger. He travelled to Puri and returned in April 1887. He made an altar for the Master in the old monastery house and also planted a Bel Tree on the same spot where Ramakrishna was cremated in Cossipore and created an altar around the tree. He went for a pilgrimage in November 1889 to Deoghar and stayed in Banshi Dutt's garden house living on alms. He went to Prayag (Allahabad), travelled through various parts of India and went to Colombo in Sri Lanka. For sometime he lived there as a preaching missionery teaching the ideals of his Master. In 1895 he returned to the Alambazar monastery before the birthday of Ramakrishna. When Vivekananda returned to India, Niranjanananda went to Colombo to receive him in 1897. He travelled with Swami Vivekananda all over Northern and Southern India. In 1898 he went to Almora and there he initiated Shuddhananda (Sudhir Maharaj). He then went to Varanasi and lived on alms. He inspired a group of youth to follow the path of service and renunciation, who later organised the home of service. 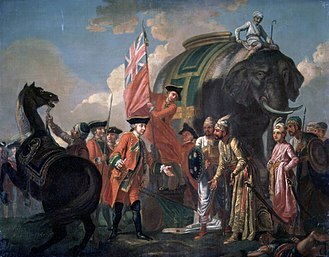 He later went to Kankhal near Haridwar and became ill and came back to Calcutta for treatment. Upon recovery he went back to Varanasi, met Vivekananda there. During Vivekananda's illness he arranged for Ayurvedic treatment and during the latter's last days he was his gatekeeper, preventing people from crowding and disturbing an ailing Vivekananda in his room. After Vivekananda's death he returned to Haridwar. During his last days he suffered from chronic dysentery. He died 9 May 1904. Niranjanananda, like his brother disciples held the Sarada Devi in very high esteem, calling her the holy mother. He took Girish Chandra Ghosh to the holy mother in her native village of Jairambati when the latter was going through a period of depression. Before his death he came to meet her and insisted that she did everything for him, including preparing food for him and feeding him. According to Ramakrishna, Niranjan was an ever pure soul and it was easy for him to realise god because he was guileless. According to the memoirs of his associate Achalananda (Kedar Maharaj) and the accounts of other brother disciples, Niranjan was marked for his simplicity, truthfulness, purity, fearlessness, steadiness (in any matter of principle) and renunciation. He once saved Sarada (Trigunatitananda), a brother disciple from drowning. He earnestly took up philanthropic and charitable work at the behest of Vivekananda and later formed the Sevashrama or the Ramakrishna Mission Home of Service at Varanasi, by inspiring a group of young men to renounce the world and take up the service of the poor. Despite in need for fund he refused donation from a rich person when the latter went back on his promise. He nursed many of his brother disciples, including Yogananda whenever they were ill. 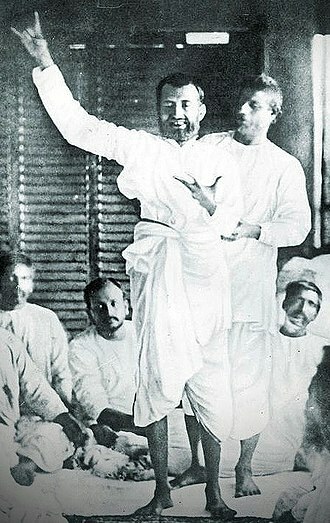 He believed in Ramakrishna as the infinite god in human form, did not put much stress on rituals, and had tremendous faith in the doctrine of service. ^ a b c d The Disciples of Sri Ramakrishna, published by Advaita Ashram, Mayawati, 1943. 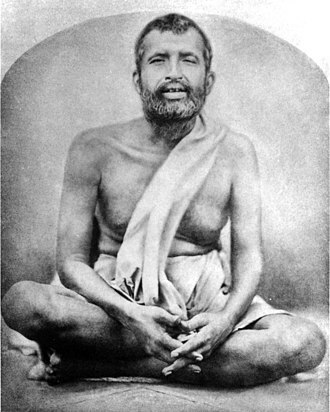 Ramakrishnananda was one of the direct disciples of Ramakrishna Paramahamsa. Known for his Gurubhakti, he served the Baranagore Math for 12 years without missing a single day, Ramakrishnananda was born as Shashi Bhushan Chakravarty on 13 July 1863. His father Ishwara Chandra Chakravarty was an expert in ritualistic worship, after passing out of the village school, he went to Kolkata and lived with his cousin Sharat for higher education. A brilliant student, he chose mathematics for the B. A. course which, while studying in a Calcutta college and Sharat joined the Brahmo Samaj, and heard about Ramakrishna from Keshab Chandra Sen himself. In October 1883 they visited Dakshineswar and were attracted to Ramakrishna. Shashi distinguished himself most by the spirit and devotion with which he served Ramakrishna during his last illness at Shyampukur. After the Masters passing he joined the Baranagar Math and underwent sannyasa ordination and he took charge of the worship of the Atmaramer kauta, the urn containing the relics of Ramakrishna in the Maths shrine. He felt the presence of the Master, and so his worship was not a mere ritual. It was Swami Ramakrishnananda who formulated and introduced the system of daily worship to Ramakrishna that is followed in the Ramakrishna Movement. He seldom went out on pilgrimage, and devoted himself to worship at the Math. But when Vivekananda, after his return from the West, asked him to go to Madras and open a centre of Ramakrishna Math there. In the South he travelled extensively, the starting of centres in Trivandrum, Mysore and Mumbai owed much to his pioneering efforts. Incessant work, especially his service to Sarada Devi during her travels in South, told upon his health and he spent some weeks in Bangalore with a hope of getting better in the salubrious climate there under the care of his brother disciple Nirmalananda. But since the deterioration continued he was sent to Calcutta He breathed his last in a state of ecstasy on 21 August 1911, extensive travels to Bangalore, Trivandrum, Ernakulam, Tirunelveli, Rangoon and other places. 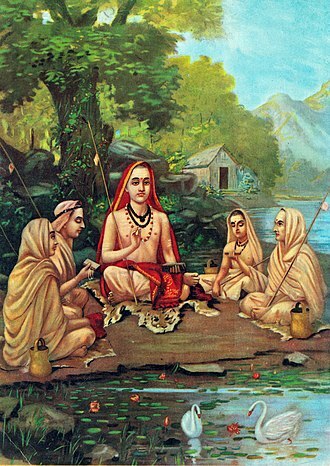 Trigunatitananda, premonastic name Sarada Prasanna Mitra, was a direct disciple of Ramakrishna, the 19th-century Indian Hindu mystic and sant. He established the monthly Bengali magazine Udbodhan of Ramakrishna Math and later, at the behest of Vivekananda, went to America in 1902, one of his contributions was the construction of a new building in San Francisco which came to be known as the Hindu Temple. He was mortally injured by a bomb thrown at him by a former student, Trigunatitananda was born as Sarada Prasanna Mitra, on 30 January 1865. He was born to a family in the village of Naora in Bhangar I. Sarada was enrolled in the Metropolitan Institution at Shyampukur and this was a school of Iswar Chandra Vidyasagar, a social reformer and scholar of 19th century India. The headmaster there was Mahendranath Gupta, better known as M, Sarada did not do well in the school leaving entrance examination. M took young Sarada to Dakshineswar temple to meet Ramakrishna on 27 December 1884, at a very young age Sarada had shown a religious disposition and this was reinforced by contact with Ramakrishna, whom he visited often after joining the Metropolitan college. When his parents decided to arrange a marriage for him according to Indian customs, he left his house for Puri in January 1886 and he appeared for and passed his First Arts examination. He dedicated himself to the service of Ramakrishna when the latter was ill in Cossipore Garden House. After Ramakrishna died, Sarada began to stay with Narendranath Dutta and a group of dedicated direct disciples of Ramakrishna, in January 1887 Sarada took the vows of complete renunciation or sannyas along with his brother disciples, and came to be known as Trigunatitananda. In 1891 Trigunatita started on pilgrimage for Vrindaban, Jaipur, after that he returned to Baranagar Math. In 1895 he set out on foot for Mount Kailash and Lake Manasarovar and he came back to Calcutta and stayed in the house of a devotee and led a contemplative life for some time. After some time he went to stay in the newly formed Alambazar Math of the Ramakrishna order and he was influenced by Vivekanandas ideal of service and philanthropic activities. Sarada Devi, born Saradamani Mukhopadhyay, was the wife and spiritual counterpart of Ramakrishna Paramhansa, a nineteenth-century mystic of Bengal. Sarada Devi is addressed as the Holy Mother by the followers of the Ramakrishna monastic order. Sarada Devi or Sri Sri Ma is one of the notable woman saints and she paved the way for the future generation of women to take up monasticity as the means and end of life. In fact Sri Sarada Math and Ramakrishna Sarada Mission situated at Dakshineshwar is based on the ideals, Sarada Devi played an important role in the growth of the Ramakrishna Movement. Sarada Devi was born in Jayrambati, at the age of five she was betrothed to Ramakrishna, whom she joined at Dakshineswar Kali temple when she was in her late teens. According to her biographers, both lived lives of unbroken continence, showing the ideals of a householder and of the monastic ways of life. After Ramakrishnas death, Sarada Devi stayed most of the time either at Jayrambati or at the Udbodhan office, the disciples of Ramakrishna regarded her as their own mother, and after their gurus death looked to her for advice and encouragement. The followers of the Ramakrishna movement and a section of devotees across the world worship Sri Sri Ma Sarada Devi as an incarnation of the Adi Parashakti or the Divine Mother. Saradamani Devi was born of Brahmin parents as the eldest daughter on 22 December 1853, in the village of Jayrambati in present-day West Bengal. Her parents, Ramachandra Mukhopadhyay and Shyama Sundari Devi, were poor and her father Ramchandra earned his living as a farmer and through the performance of priestly duties. 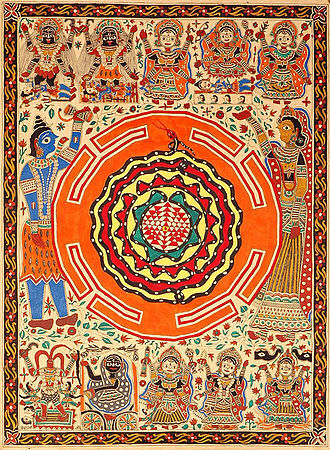 According to traditional accounts and Syamasundari had visions and supernatural events foretelling the birth of a divine being as their daughter, Sarada lived the simple life of an Indian village girl. As a child Sarada—then known as Saradamani—was fascinated by traditional Hindu folklore, during the terrible famine of 1864, Sarada worked ceaselessly as her family served food to hungry people. She was interested in the models of goddesses Kali and Lakshmi. She is said to have started meditating from her childhood and traditional accounts recount her mystic visions, according to Sarada Devi, she used to see a bevy of eight girls of her age coming from an unknown place and escorting her in her chores during her childhood. Haridwar pronunciation spelled Hardwar is an ancient city and municipality in the Haridwar district of Uttarakhand, India. Haridwar is regarded as one of the seven holiest places to Hindus and this is manifested in the Kumbha Mela, which is celebrated every 12 years in Haridwar. Brahma Kund, the spot where the Amrit fell, is located at Har ki Pauri and is considered to be the most sacred ghat of Haridwar, Haridwar is the headquarters and the largest city of the district. The name of the town has two spellings and Haridwar, each of these names has its own connotation. So, Haridwar stands for The Gateway to Lord Vishnu, in order to reach Badrinath, one of the four Char Dhams, with a temple of Lord Vishnu, Haridwar is a typical place to start a pilgrims journey. On the other hand, In Sanskrit, Hara means Lord Shiva, Hardwar stands for Gateway to Lord Shiva. Har ki Pauri or footsteps of Lord Shiva is considered the most sacred site in Hardwar, Haridwar is known as the home of Devi Sati and the palace of her father Daksha. 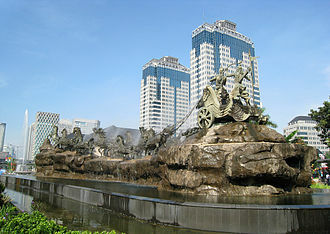 In ancient times, the town was referred to as Gangadwára. Ayodhyā Mathurā Māyā Kāśī Kāñcī Avantikā Purī Dvārāvatī caiva saptaitā mokṣadāyikāḥ– Garuḍa Purāṇa I XVI.14 Lit, Mathura, Kasi, Kanchi and Dwaraka are the seven holy places. Note the use of puranic name Maya for Haridwar, as the inter-change usage of Puri and Dwaraka. The Garuḍa Purāṇa enumerates seven cities as giver of Moksha, Haridwar is said to be one of the seven most holy Hindu places in India, with Varanasi usually considered the holiest. 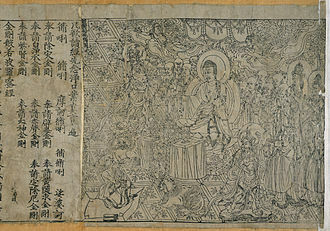 A Kṣetra is a ground, a field of active power. In the scriptures, Haridwar has been mentioned as Kapilasthana, Gangadwara. It is a point to the Char Dham, hence and Vaishnavites call this place Hardwar and Haridwar respectively, corresponding to Hara being Shiv. Sage Kapila is said to have an ashram here giving it, its ancient name, Lord Vishnu is said to have left his footprint on the stone that is set in the upper wall of Har Ki Pauri, where the Holy Ganges touches it at all times. Haridwar came under the rule of the Maurya Empire, and under the Kushan Empire, Archaeological findings have proved that terra cotta culture dating between 1700 BCE and 1200 BCE existed in this region. Belūr Maṭh or Belur Mutt is the headquarters of the Ramakrishna Math and Mission, founded by Swami Vivekananda, a chief disciple of Ramakrishna Paramahamsa. 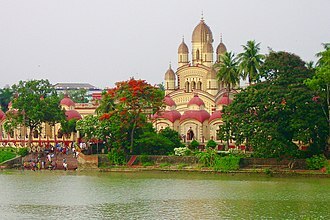 It is located on the west bank of Hooghly River, West Bengal and this temple is the heart of the Ramakrishna Movement. The temple is notable for its architecture that fuses Hindu, Christian, in January 1897, Swami Vivekananda arrived in Colombo with his small group of Western disciples. Two monasteries were founded by him, one at Belur, which became the headquarters of Ramakrishna Mission and these monasteries were meant to receive and train young men who would eventually become sannyasis of the Ramakrishna Mission, and to give them a training for their work. 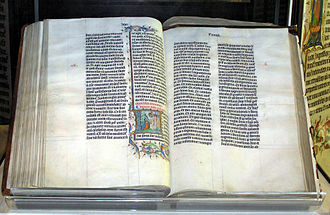 The same year the philanthropic activity was started and relief of the famine was carried out, during his tour in America and Europe, he came across buildings of architectural importance of Modern, Medieval and Renaissance styles. It is reported that Vivekananda incorporated these ideas in the design of the Belur Math temple, the massive construction was handled by Martin Burn & Co. The mission proclaims the Belur Math as, A Symphony in Architecture, the campus houses a Museum containing articles connected with the history of Ramakrishna Math and Mission. Several educational institutions affiliated with the Ramakrishna Mission are situated in the vast campus adjacent to Belur Math, the Belur Math is considered as one of the prime tourist spots near Kolkata and place of pilgrimage by devotees. The ex-president Abdul Kalam regarded Belur Math as a place of heritage, the design of the temple was envisioned by Swami Vivekananda and the architect was Swami Vijnanananda, a direct monastic disciple of Ramakrishna. Sri Ramakrishna Temple was consecrated on 14 January, the Makar Sankranti Day in 1938, the Ramakrishna temple at the Belur Math is designed to celebrate the diversity of Indian Religions and resembles a temple, a mosque, a church if seen from different positions. The architectural style and symbolism from a number of religions have been incorporated into the design of the temple at Belur Math, the temple is considered as a prime example of the importance of material dimension of religion. Jayrambati is a town, in the jurisdiction of Kotulpur police station in the Bishnupur subdivision in Bankura district, West Bengal, India. Jayrambati is three miles to the west of Kamarpukur and two miles to the east of Sihar - the birthplace of Hridayrama Mukhopadhyaya, a nephew of Sri Ramakrishna and Arambag are twenty-seven miles and twelve miles distant respectively from Jayrambati. The village, surrounded on all sides by green pastures, untrimmed meadows, the area that extends for about half a mile between this village and the Amodar is very fertile and yields all kinds of vegetables and other agricultural products. The main source of irrigation of the cultivable lands is the big lake called Mothers Tank where the visitors. It is said that the Holy Mother in her girlhood used to cut grass for cows in neck-deep water from this very tank. At present water is supplied to this reservoir from the river Amodar by means of a pump and is used for the irrigation of the surrounding fields. There is another tank called Barunjjey Pukur which lies on the corner of this village and is surrounded with palmyra trees. Sarada Devi was born in village in 1853. This village with its sacred traditions has become a place of pilgrimage. On one occasion, the Holy Mother, after touching the dust of this place with her forehead, Ones own mother, Jayrambati can be reached from Howrah by train up to Arambagh and by bus. One can come by road from Kolkata, buses are available from Esplanade to Bishnupur which touches Jayrambati in its route. The village hosts a temple of Vivekananda monks and the school for boys that the monks operate. The school hosts around 250 boys, providing them with an education through junior high, there is a temple called Naranarayan Temple where a child of below 5 years of age is worshipped as God Narayan at 10,00 A. M daily. This is an experiment started by Swami Nityanandaji Maharaj of Vivekananda Math to manifest the saying of Shiva in Jiva. The offerings in this puja are unusual which suits the need of a child like, there is Matrimandir dedicated to Ma Sarada devi, the spiritual consort of Sri Ramakrishna. Ramakrishna Mission is an Indian religious organization which forms the core of a worldwide spiritual movement known as the Ramakrishna Movement or the Vedanta Movement. The mission is a philanthropic, volunteer organisation founded by Ramakrishnas chief disciple Swami Vivekananda on 1 May 1897, the mission conducts extensive work in health care, disaster relief, rural management, tribal welfare and higher education and culture. It uses the combined efforts of hundreds of ordered monks and thousands of householder disciples, the mission bases its work on the principles of karma yoga. The mission, which is headquartered near Kolkata at Belur Math in Howrah, West Bengal and it is affiliated with the monastic organisation Ramakrishna Math, with whom it shares members. Also referred to as the Ramakrishna Order, the Math is the monastic organisation. Founded by Ramakrishna in 1886, the Math primarily focuses on spiritual training, the Mission, founded by Vivekananda in 1897, is an humanitarian organisation which carries out medical and educational programs. Both the organisations have headquarters at the Belur Math, the Mission acquired a legal status when it was registered in 1909 under Act XXI of 1860. Its management is vested in a Governing Body, though the Mission with its branches is a distinct legal entity, it is closely related to the Math. The elected trustees of the Math serve as Missions Governing Body, Vedanta Societies comprise the American arm of the Movement and work more in purely spiritual field rather than social welfare. Ramakrishna Paramahansa, regarded as a 19th-century saint, was the inspirator of the Ramakrishna Order of monks and is regarded as the founder of the Ramakrishna Movement. Ramakrishna was a priest in the Dakshineswar Kali Temple and attracted several monastic, narendranath Dutta, who became Vivekananda was one of the chief monastic disciples. 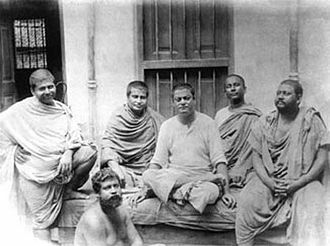 According to Vrajaprana, shortly before his death in 1886 Ramakrishna gave the ochre cloths to his young disciples, Ramakrishna entrusted the care of these young boys to Vivekananda. Binodini Dasi, known as Notee Binodini, was a Calcutta-based, Bengali-speaking renowned actress and thespian. She started acting at the age of 12 and ended by the time she was 23, as she recounted in her noted autobiography. Her career coincided with the growth of the form of European theatre among the Bengali theatre going audience. During a career spanning twelve years she enacted over eighty roles, which included those of Pramila, Draupadi, Ayesha, Kaikeyi and she was one of the first South Asian actresses of the theatre to write her own autobiography. Her sudden retirement from the stage is insufficiently explained, sri Ramakrishna, a saint of 19th century Bengal, came to see her play in 1884. During her bygone days of glory, she was referred to as the Flower of the Native Stage and she was a pioneering entrepreneur of the Bengali stage and introduced modern techniques of stage make-up through blending European and indigenous styles. This may be explained as an instance of class-caste divide. Prince Bhagiratha in penance for the salvation of 60,000 of his ancestors. Neeldhara Bird Sanctuary at the main Ganges Canal, before Bhimgoda Barrage, also showing signs of an ancient port. Clockwise from top left: All Saints Cathedral, Khusro Bagh, the Allahabad High Court, the New Yamuna Bridge near Sangam, the skyline of Civil Lines, the University of Allahabad, Thornhill Mayne Memorial at Alfred Park and Anand Bhavan. Allahabad Fort, built by Mughal Emperor Akbar in 1575 on the banks of the Yamuna River. 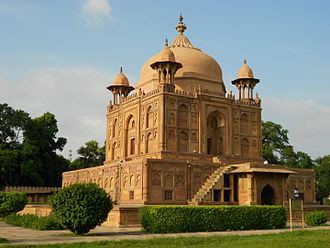 Tomb of Nithar Begum (daughter of Mughal Emperor Jahangir) at Khusro Bagh. The 5 volumes of Kathamrita for display at Kathamrita Bhavan.